Just in time for today's early digital release of one of the biggest movies of the year, Marvel's Avengers: Age of Ultron, Disney announces significant partner and device additions to its cloud-based digital movie service, Disney Movies Anywhere (DMA), continuing to expand upon its promise to provide more ways to buy and watch your favorite Disney, Pixar, Marvel and Star Wars movies at home or on the go. Starting today in the U.S., Amazon Video and Microsoft Movies & TV customers can connect to Disney Movies Anywhere and access their digital collection across the Disney Movies Anywhere ecosystem, including via the new Disney Movies Anywhere app for the Microsoft Xbox 360 and for Amazon's Fire tablets, Fire TV and Fire TV Stick. 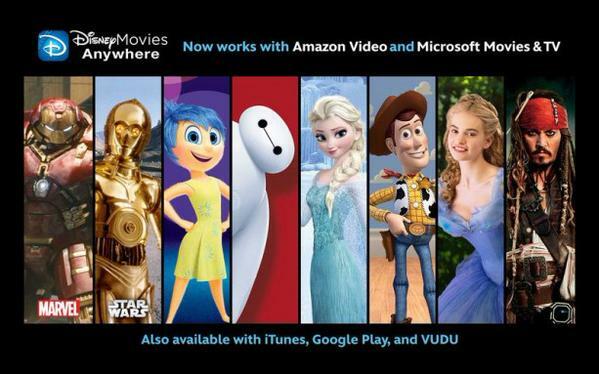 In addition to the Disney Movies Anywhere app, customers can access and watch titles in their Disney digital collection directly through the Amazon Video app for TVs, connected devices and mobile devices, or online at Amazon.com/amazonvideo, and via the Microsoft Movies and TV service on Windows and Microsoft Xbox devices or at microsoft.com/en-us/store/movies-and-tv. Launching on September 15, with the release of Disney's live action Cinderella, the Disney Movies Anywhere app will become available on the Roku® platform and Android TV allowing consumers to access their DMA movie collections. Disney Movies Anywhere already works with iTunes, Google Play, and Walmart's VUDU. In celebration of this partner launch, for a limited time Disney Movies Anywhere is offering a free digital copy of Disney•Pixar's Monsters, Inc. to new and existing members who connect an iTunes, Amazon Video, VUDU, Microsoft Movies & TV or Google Play account for the first time. 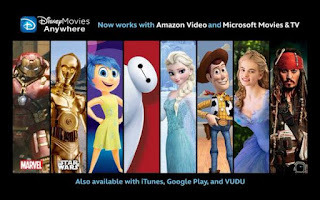 Disney Movies Anywhere (DMA) is an engaging and family-friendly cloud-based digital movie service that makes it simple to buy your favorite Disney, Pixar, Marvel and Star Wars movies once and watch them anywhere. With DMA you can explore Disney’s library of over 450 eligible digital movies, discover hours of new and exclusive short-form content, and watch your digital movies from the comfort of the living room or across multiple mobile devices. Using the free DMA apps and website, you can connect your DMA account with participating providers including iTunes, Amazon Video, VUDU, Microsoft Movies and TV and Google Play and unlock to access your eligible movie collections across platforms and devices – iPhone, iPad, iPod Touch, Apple TV/Airplay, Amazon’s Fire tablets, Fire TV and Fire TV Stick, Microsoft Movies and TV service on Windows and Microsoft Xbox devices, Android mobile and tablet devices and Android TV, Chromecast and the Roku® platform. In addition, you can redeem Digital Copy codes found in Disney, Pixar and Marvel Blu-rays and DVDs, as well as earn Disney Movie Rewards points with every digital purchase. 0 comments on "Disney Movies Anywhere Significantly Increases Digital Footprint With Addition Of New Partners And Apps"